It was compulsory to me, to shot the Italian champion while passing beside this painted wall on the climb to Plan di Montecampione during stage 15 at Giro d'Italia 2014. But what strikes me most of this picture are not the colors of "my flag" but the row of beer bottles on the top of the wall. They were really many and all drunk by the same group of guys. What's better than a fresh beer while waiting the Giro on the road? 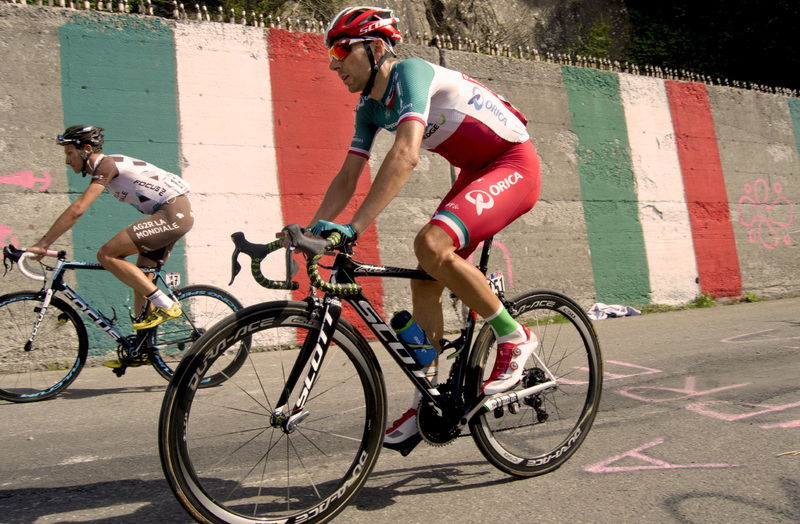 Now, Ivan didn't realize all of that while climbing the long road to the Plan; he arrived 99th of the day at almost 20 minutes from Fabio Aru, in the day of the his first win at Giro. Ivan Santaromita had a long carreer in WT teams but he never took off as expected. He did some great job in BMC as well as in Orica but the hope was for a complete profile for GT standings, which was never confirmed. He is still young, just 31, but he races for a Continental Team now, and it seems difficult to see him back in big cycling events.